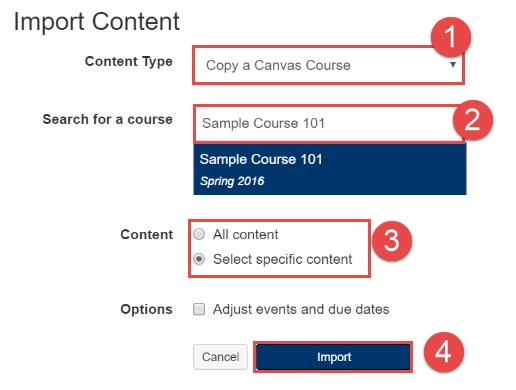 These instructions are used to copy content between Canvas Course sites. Media Library content is not included with this process. In order to copy your Media Library content, please see this article: How do I migrate Media Library course content from one library to another? Navigate to the Canvas course in which you wish to copy material into. 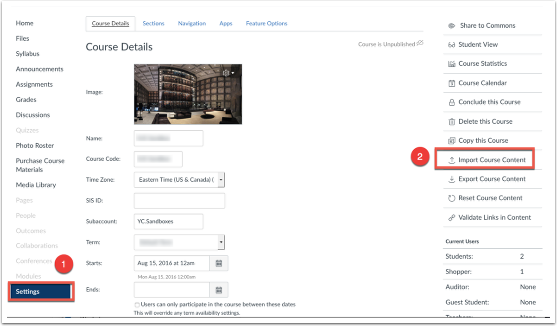 Click the "Settings" button in your course navigation bar. Click the "Import Content into this Course" button on the right side of the screen. 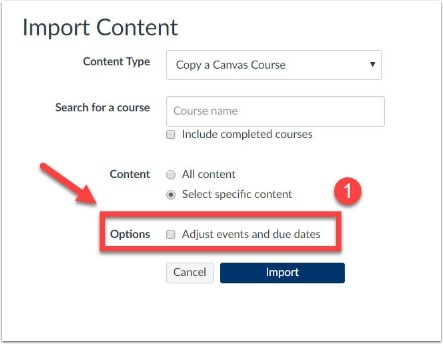 Content Type: From this drop down menu, select "Copy a Canvas Course"
Search for a course: Begin typing the name of your course - as you type, Canvas will show you options that match your search criteria. When the correct course title appears, click on that course. 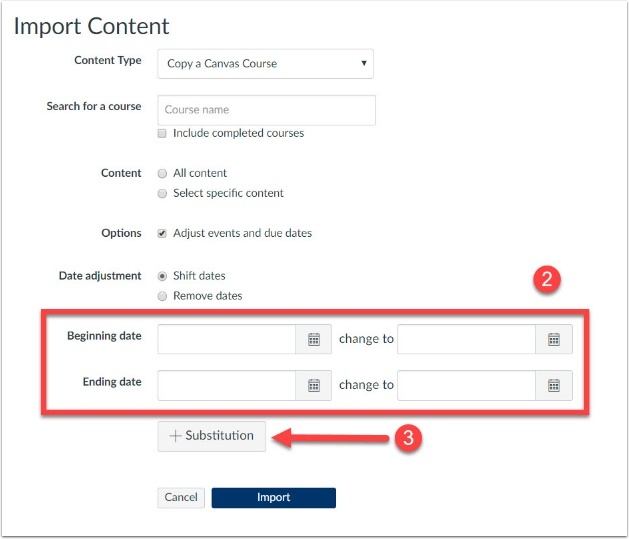 Select whether you want to import all content from the course or if you want to select just specific pieces of the content. If you are importing all content - the process will begin and your course materials will be imported. Depending on how large your course is, this process may take several minutes to complete. You will be able to see the progress under the "Current Jobs" section of the Import Content page. If you are importing only specific content (not all), please continue with the next steps. Once you have triggered the import process, you will see your import listed under the "Current Jobs" area of the Import Content Page. 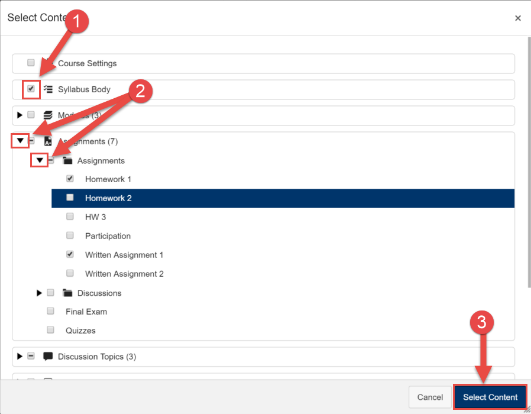 To choose which parts of your source course will be copied, click the "Select Content" button to the far right of the job. Select the check boxes next to the content that you want to copy (1). For some content types, you may be able to expand and see more options by clicking on the down arrow (2). When you have selected everything that you need, click the "Select Content" button (3). The process will begin and your selected course materials will be imported. Depending on how large the content is, this process may take several minutes to complete. You will be able to see the progress under the "Current Jobs" section of the Import Content page. 1. Click on the Option for "Adjust events and due dates". 2. Fill out the original start date and the new start date. 3. You can click +Substitution to change which days of the weeks the events and due dates should now be on (if applicable). 4. Change days of the week (if applicable). For more information, please visit the vendor guide found here. Prev: How can I see what the students see? Next: How do I re-organize my Course Navigation?